Sensuntepeque, Cabañas, El Salvador—On November 25, 2010, a district judge in Cabañas, El Salvador, dropped serious charges against seven local environmentalists who were accused by Vancouver-based Pacific Rim Mining of “kidnapping”, “aggravated robbery,” and “aggravated threats” among others. All seven were members of the Cabañas Environmental Committee for the Defense of Water and Culture (CAC); charges of property destruction were referred to a different court. 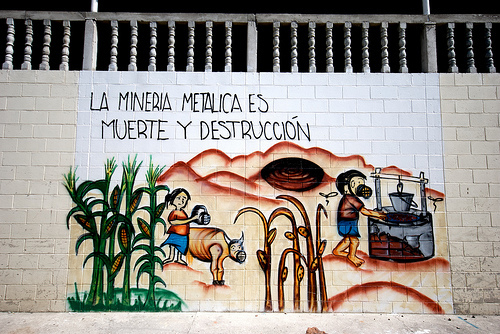 The charges come four years after 2006 protests at the Santa Rita mine site on the Cerro Limón hill, located in the rural community of Trinidad in Cabañas, which successfully halted activity at the mine. According to members of the CAC, representatives and employees of Pacific Rim were not present during Thursday’s hearing, while outside of the courthouse, 150 community members had gathered to support the accused. “Apparently the company’s employees did not want to show their face in front of all the people gathered outside to support us,” said the Cabañas Environmental Committee in a Friday, Nov 26 press release. Pacific Rim CEO Thomas Shrake and Chair of the Board Catherine McLeod-Seltzer, continue to paint themselves as the victims in hearings before the International Centre for the Settlement of Investment Disputes at the World Bank, where they are suing El Salvador for at least $77 million dollars years after the Ministry of Environment and Natural Resources denied their application to exploit gold at the El Dorado mine, also in Cabañas. The next hearing is slated for early spring, where the Government of El Salvador is expected to raise objections to Pacific Rim’s change of nationality from Vancouver, B.C. to the state of Nevada in order to exploit the foreign investor provisions in the U.S.-Central America Free Trade Agreement. Support PCASC volunteers with their delegation to Honduras! Frustrated by the increasing bureaucratization of her local public school system, Zavala was eager to see another model at work.